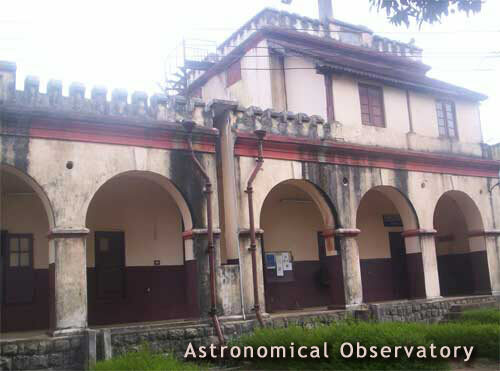 The Trivandrum Observatory was started by the Maharaja Swathi Thirunal of Travancore in 1836. During 1837 under the supervision of Mr.John Caldecott, the then Commercial Agent of Travancore Government at Alleppey. It was designed for both astronomical and meteorological work. It is one of the oldest observatories of its kind in India. Later in 1852, Mr.John Allan Brown, F.R.S started magnetic observations to study terrestrial magnetism. 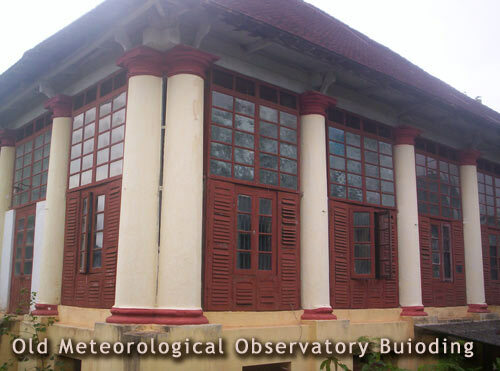 Meteorological Observatory took its origin in 1853 from this observatory. This observatory was divided into 2 sections viz. Meteorological & Astronomical in 1927. In the same year, Meteorological Section was recognized by Govt. of India as a Class 1 Meteorological Observatory and started sending the eye observations of the meteorological elements to Pune telegraphically for weather forecasting. Pilot Balloon ascent for measurement of wind speed and direction was started in 1928. Meteorological Section was taken over by Govt. of India in 1951. Radiosonde observations were started in 1956. It started issuing weather forecast in 1963. Upgraded to Meteorological Centre in 1973. It functions in its own building situated on a hillock in the heart of the city.